While most of you will be sleeping in tomorrow morning, here at Exclaim! 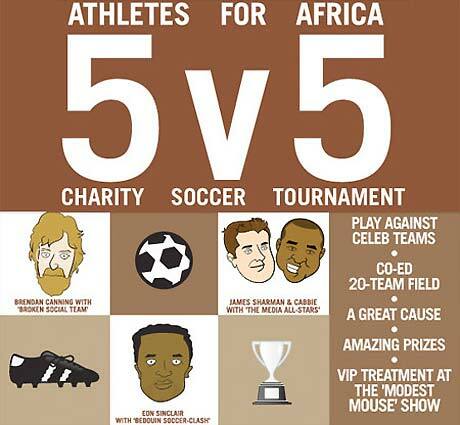 we're going to be getting ready to hit the fields for a soccer game against members of Bedouin Soundclash and Broken Social Scene for Toronto's first ever Athletes for Africa Soccer Tournament. At the same time, our players and other good-hearted musicians such as Weezer's Rivers Cuomo and Ted Leo will be helping out good cause. Athletes for Africa is an NGO that uses sports to empower youth in Africa, while raising awareness about conflict on the continent. The soccer tournament on Saturday (August 22) is a fundraiser for a youth sports centre in northern Uganda, an area that has been war-torn for the past 22 years. Along with sending our players to the field, Exclaim! is also helping to sponsor the event. "The tournament allows us to raise money for a worthy cause, and make sure people in the office get exercise at the same time," says Exclaim! publisher and founder Ian Danzig. In addition to the aforementioned celeb players, former MuchMusic VJs Rick "The Temp" Campanellie, Tony "Master-T" Young, and Kris McFarlane and Murray Foster of maritime folk band Great Big Sea will also be participating. To watch the tournament, head down to Toronto's Cherry Beach Fields, where the event will take place from 2 p.m. to 8 p.m. Admission is free. For directions and more information, visit tournament's website here.